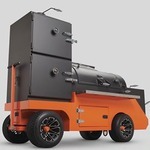 Yoder Smokers Community Forum • View topic - Pig on the Grill? Re: Pig on the Grill? Smaller pigs can be cooked on the Yoder(s), but there are size constraints. Not sure which grill that you are asking about, but if you have an idea, we can make it happen. Call 877.409.6337, ext 1 to discuss. Here is a chart with approximate pig sizes to figure if a particular size pig will fit on a specific grill. You will also need to decide on the position, head on, head off, legs on, legs off, etc.